Jamuna Bank Limited Job Circular 2015 has been published recently. Being one of the leading Banks in Bangladesh, the authority always keen to recruit a number of talented and hard working employees in various position. Jamuna Bank Limited Job Circular is actually to hire Zonal Head and Company Secretary. The interested applicants are welcomed to apply as soon as possible. All updates of Jamuna Bank Job Circular will be provided here. Stay updated by going through our site. 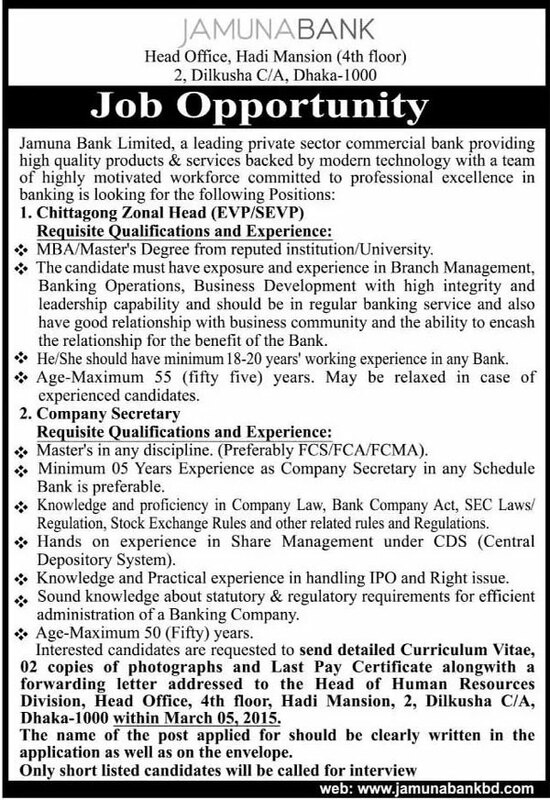 The candidates should fulfill below mentioned requirements as instructed in Jamuna Bank Circular. The candidate should have MBA/ Masters Degree from reputed University. Proper experience in Branch Management, Banking operations and Business Development is must. Minimum of 18/20 years experience in banking sector is highly needed. Hard working attitude and leadership skill is among the requirements of the job. Maximum 55 years. But it may be relaxed for the experienced candidates. For the post of Company Secretary the candidate have to meet following requirements as mentioned in Jamuna Bank Limited Job Circular. The candidates must be masters in any subject. FCS/FCA/FCMA is more preferable. Minimum of five years experience as Company Secretary is needed. Required Knowledge The candidate must have proper command over Bank Company Act/, SEC Laws, Stock Exchange and other relative issues. Experience in Share Management is also needed. Practical knowledge in handling IPO is a must. Knowledge about statutory and regulatory requirements is also needed. The interested candidates are instructed to send their CV with 2 recent Photographs and Last Pay Certificate along with a forwarded letter in the below mentioned address. The desired post name should e clearly written on the envelope as mentioned in Jamnu Bank Job Circular 2015. For more updates about Jamuna Bank Job please stay connected with us.